This article developed from a seminar Philip gave in France towards the end of 2011 to leading members of the French 'Clean' community at a 3-day conference on ‘Emergent Intelligence’ facilitated by Jennifer de Gandt. Philip had been invited to deconstruct the process that led to the emergence of his book on David Grove's Clean Language, ‘Trust Me, I’m The Patient’ ('Faites-moi Confiance, C’est Moi le Patient'). Here he reports on the genesis of both book and article. I had already spent a year researching a book on Clean Language (eventually to become Trust Me, I’m The Patient) when David asked me to write about his latest work in Emergent Knowledge and the Power of Six. It was December 2006. David was not well. Looking back now, I believe he had a sense that he had not long to live. He died, suddenly and sadly, in January 2008 in the United States, not long after I had completed a first draft of The Power of Six, the book we planned together on a remote mountain-top in his beloved North Island, New Zealand. Trust Me, I’m The Patient took me a further two years to write and publish. It is dedicated to the remarkable man who inspired it and to another very important person in my life. Writing it called for a significant emotional and intellectual commitment. 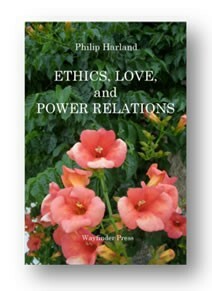 The article Ethics, Love, and Power Relations emerged as a result of writing Trust Me. It is a very different product, but came into being from the interaction of the same three systems that underlie the book. They are PHILOSOPHY, RELATIONSHIPS, and STRUCTURE. My version of PHILOSOPHY (which I hope will be shared by most members of the Clean community) consists of a mix of Ethics, Love, and Power Relations. The RELATIONSHIPS of significance to me during the writing of the book were those with Carol Thompson, David Grove, James Lawley, Caitlin Walker, Jennifer de Gandt, and Maurice Brasher. The love of STRUCTURE I identify has three parts: before the book; the substance of the book; and a post-script to the book. The article goes into some detail on each of these (yes, the people too) and concludes that it is the interaction and iteration of such systems that results in the emergence of something more than the sum of its parts. In this instance, a 4,000 word article that aims to inform and engage, and to persuade the reader of a simple proposition: that if the age of speculative analysis is long gone and if the era of directive and suggestive changework is coming to an end, then the exhilarating mix of ethics, love, and Socratic power relations that is at the heart of Clean Language is our best bet for the future.